What do you call someone who ‘bah humbugs’ Halloween? When my kid was little it was so much fun. I have oodles of Halloween decorations. I didn’t even open the boxes this year. I was all, yay I’m bringing the Halloween boxes upstairs. And then they sat in the living room for 2 days and I was all, nah not gonna happen because no one gives a damn. And back down to the storage room they went. And then I was all, but I gotta do something for Halloween. And we got invited to a party, so I was all I am making the most awesomest Harry Potter costume for my teenager because everyone at his job uses that as his nickname. So I scrounged up every Harry Potter DIY pin from Pinterest to try to deliver on my promise and I made a magic wand and a back up magic wand and I planned a trip to buy fabric for the Invisibility Cloak and I got the Gryffindor crests done and I started to crochet a scarf and then those a-holes decided we weren’t going to the party after all. I also kept the magic wand and the back up magic wand. If those boys mess with me I shall turn them into toads. 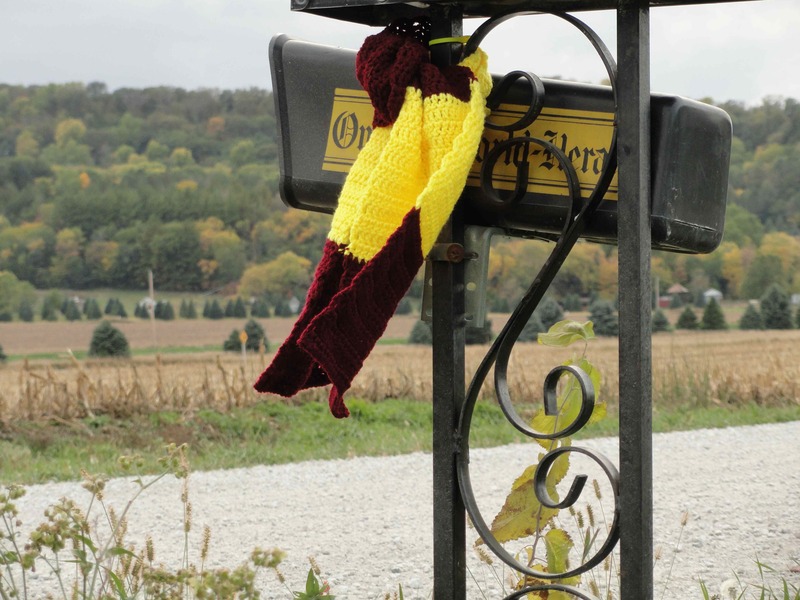 I love the scarf tied to the mailbox! It makes one wonder what happen to Harry! When you turn them into toads, be sure to get plenty of pictures!! LOL! !